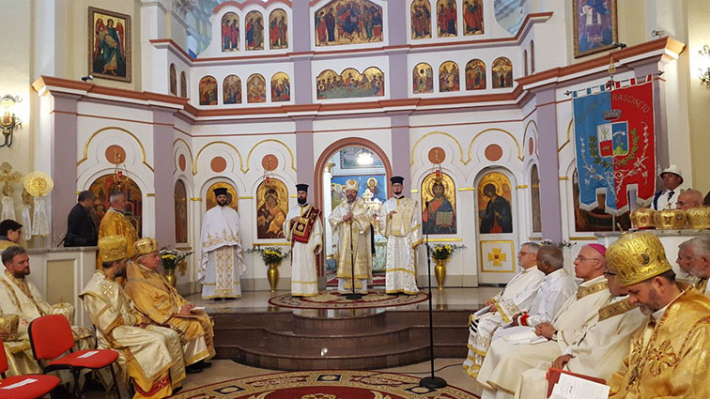 Between June 14-17, His Beatitude Sviatoslav, the Head and Father of the UGCC, is on a visit to the city of Lungro (South of Italy) at a meeting of the Eastern Catholic Bishops of Europe. In his sermon during the Divine Liturgy in Fraсineto, the Primate of the UGCC congratulated the Italian-Albanian Church and referred to her example as "the testimony of God's actions in the history of her people." "Celebrating the centenary of your eparchy, we see a living and active church community. The history of your nation shows God's presence in your life. This testimony is an example of courage and endurance for us, Ukrainians, because in our country a horrible war lasts for four years already. Only in the last 24 hours two young men were killed and six - were wounded. Today, like you five centuries ago, we are forced to leave our native land massively, but you are an example for us how to preserve national and church identity," with these words the Head of the UGCC addressed the Bishop of the Italian-Albanian diocese Donato Oliviero. It should be added that more than fifty Eastern Catholic Bishops are taking part in the Congress of Eastern Catholic Bishops of Europe, among them: Cardinal Leonardo Sandri, Prefect of the Congregation for the Oriental Churches, Cardinal Angelo Bagnаsсo, President of the Council of Bishops' Conferences of Europe (CCEE), and His Eminence, Emil Paul Tscherrig , Apostolic Nuncio in Italy. The main topics of the meeting are: the identity of the Eastern Catholic Churches in Europe, the role of Bishop in the context of some aspects of the new marital process, the revival of the Liturgy with regard to its faithfulness to the identity of the Eastern Catholic Churches and with regard to its ability to restore human life.